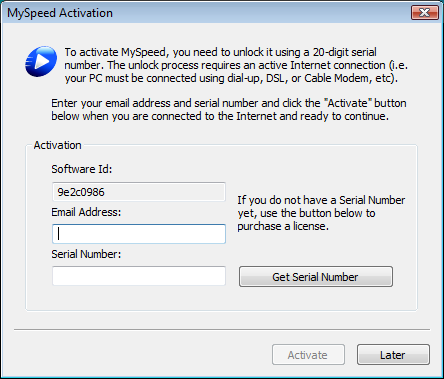 To activate MySpeed or MySpeed Premier you need a Serial Number. The Serial Number is included on the "Enounce Purchase Download and Activation Info" email. If you did not receive this email right after you completed the purchase, it may be in your spam folder. Please contact support if you have not received it. If you have not yet purchased a Serial Number, please use the Buy Now link on the menu at the top of page. To activate MySpeed, follow these instructions. These instructions assume that you have already installed MySpeed and see the MySpeed icon in the System Tray. Make sure MySpeed is running. You should see the MySpeed icon in the System Tray typically at the lower right hand corner of your screen. If you do not see the icon and have already installed MySpeed, trying launching the program from the Windows Start menu. 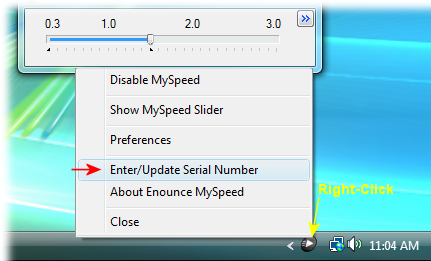 Right-Click on the MySpeed icon to display the MySpeed menu. On the activation screen, enter your email address and your Serial Number. You must use the same email address each time you activate MySpeed although this does not have to be the same address used on the checkout form. Then click the Activate button. The program will send this information to our activation server which will return a license key that will be saved on your computer. If you have difficulties with the activation process, please submit a support request using our online support form.